Today I'm sharing another make for my friend's bridal shower. (If you're just tuning in, I also made a kitchen wall art piece and a doily and coasters set.) In the invites that we sent out, we included a 4 1/2 by 6 1/2 inch recipe card for people to fill out and bring to the shower! So we needed something to collect all the cards. Here's where I enlisted the help of my dad. 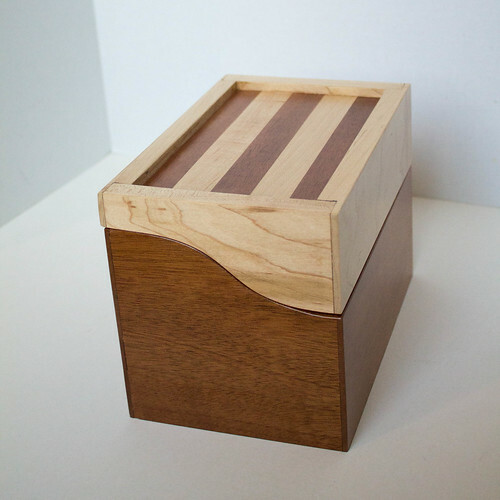 I drew out some sketches, came up with some dimensions, and my dad brought the sketches to life with this beautiful mahogany and maple recipe box! I finished it with some sanding sealer and three coats of polycrylic so we could keep the natural colors of the wood! I made the recipe card dividers from bright colored card stock to match the invites and the decoration colors. And here's a shot of it in action at the shower with some recipes in it! I think it turned out great! I have some decoration makes from the kitchen themed shower I can show you another time. I don't want to brag or anything, but this group of bridesmaids is pretty darn crafty! Oh this box is gorgeous!! If my Dad was still with us he would really appreciate the time and skill that has gone into making it. He would have loved the challenge to. Gorgeous!!!!!!! 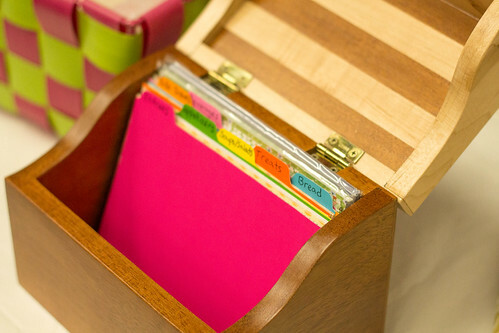 you have such good ideas with wood!!!!! What a beautiful recipe box. 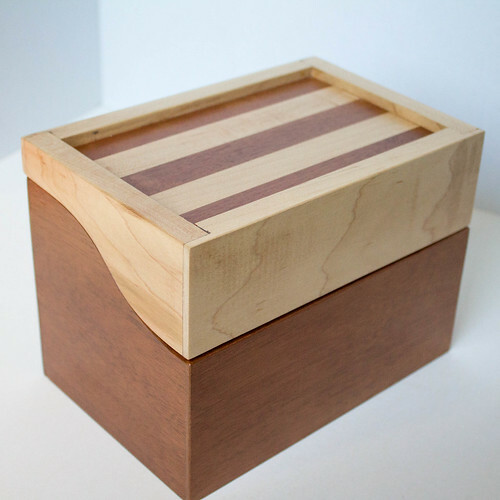 I love the combination of mahogany and maple together and what a wonderful idea to request that everyone bring a recipe for the box. The brightly coloured card dividers are fun too. This is a really lovely gift to give, but especially to receive! This is a stunning box! Your friend is going to love it!! Thanks!! I think she does, and I'm so glad that everyone seemed to remember to bring their cards to put in it!! This is beautiful! I love the curved detail. Also, the contrasting stain is a fun element too! 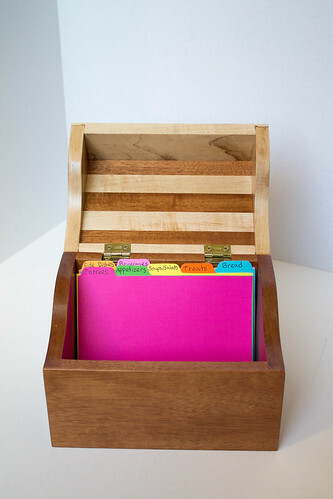 A recipe box is such a great gift idea. They'll use it forever. This is a beautiful piece and thoughtful gift!